"Use this in place of your favorite gluten-free flour. This is the best one! Use it in pancakes, muffins, cakes, as a thickener, or almost anywhere you use wheat flour." Sift brown rice flour, potato starch, tapioca starch, and xanthan gum together into a large bowl; mix thoroughly. Store in a sealable container. Fire-roasted pineapple upside down cake! I converted this blend of awesomeness to a self-rising flour by adding 1.5 tsp baking soda, 1.5 tsp salt and 1.5 Tbsp baking powder. 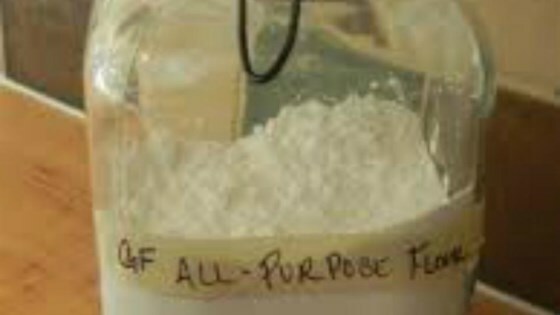 I made this flour and used it in the "Fluffy Pancakes" recipe on this site. It was so good it was hard to tell it was gluten free. Thanks a ton! Perfect!!!!! Land o lakes has a pie crust recipe that's great and they gave this same recipe for the flour with great reviews!! Love!! This is great. I make one bowl chocolate cake with it, and it turns out fantastic. Would never know it is gluten free.